Today's Pilcow fun was a trip to the Book Cellar in Lincoln Square. The Book Cellar is the official bookstore of the Pilcrow Lit Fest, and books from participating featured authors are available there. 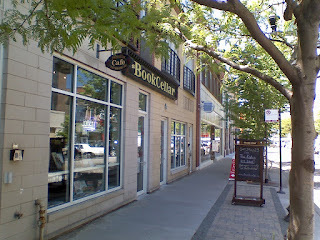 The Book Cellar is nestled in a nice block of like-minded cool, urban boutiques in a part of Lincoln Square so trendy that a guy who weighed probably all of 110 pounds was stalking around in nothing but a pair of jeans, an iPod, and really scraggly beard. It doesn't get any trendier than that, baby. Anyway, the big draw of the Book Cellar is that it's an indie bookstore, and a cool one. Instead of the sterile rows of brown-on-brown carpeting and prefab shelving at Borders that only reach to your knees, the Book Cellar is a warren of tall bookcases with ladders and doorways cut into the stacks. You walk through the shelves and you feel like you're stepping into a labyrinth of books. There are books crammed on the shelves as though there isn't enough room, and stacked atop the shelving where space permits. You'd think this would lend itself to an odd form of claustrophobia (or the occasional frown from the fire department), but for those of us to whom the concept of heaven resembles a cozy, comfortable library safe and isolated from the nonstop march of urban life, this place is womb-like and welcoming. It's the sort of place you could be in for three hours and turn a corner to realize you'd missed an entire row of awesome indie books mixed with the best of contemporary big-house offerings. 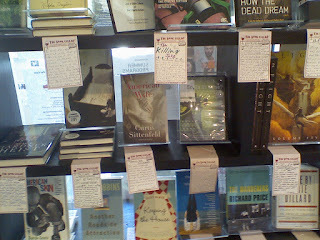 As an author, I particularly appreciated the hand-written notes on the shelves describing briefly books that wouldn't otherwise jump off the shelf but nonetheless are pivotal offerings of the selected genres. If only someone had put a little helpful note on "Ender's Game" when I was a kid, it might not have taken me as long to find it. Very cool. Speaking of cool, I've got a trivia question for you: what's cooler than an indie bookstore with a wine list? Go ahead. I'll wait. ...Look, I haven't got all day, we both know NOTHING is cooler than that. The addition of food, wine, and coffee makes The Book Celler something like a cross between a wild stepsister of Starbucks and the magical personal library of a mansion owned by a hip, eccentric millionaire. 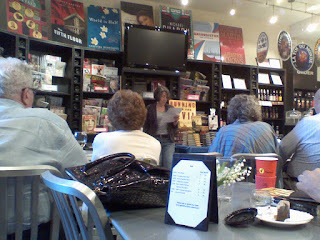 Jamie Freveletti and Gillian Flynn told us about their newest works (Running from the Devil and Dark Places, respectively) and we were even treated to a reading from Lenny Kleinfeld's book Shooters and Chasers, read by his wife, none other than NPR correspondant Ina Jaffe.